The morning was a breakfast for heroes, as you may well imagine, and included a cabaret of fractious children and deaf pensioners. After eating as much as we could we said goodbye and got our lunch from a shop over the road. After filling up our lunch boxes with vegetable fajitas, caramel wafers and carton after carton of drinks, we set off up the hill in the direction of Berrynabor and Widmouth Head. It was a lovely sunny day and very hot although this section of path goes over roads and is not great walking. Eventually we got back on a footpath which ran steeply uphill through woods and soon started to have sea on the right-hand side. The day was absolutely gorgeous, as warm as you could wish for, and the walking was very enjoyable. We descended into Watermouth harbour which was full of sailing boats, lengths of rusty chain, mud and seaweed. At this point the path offers an option of walking across a section of the harbour floor provided the sea isn’t occupying the same space. Naturally Andy, ever the child, wanted to walk it but the book issues dire warnings about not doing this at high tide. We had been convinced it would require really serious consideration so as not to get ourselves stranded. In the event it was about 50 feet long. After scrambling over the slimy rocks we were back on a wooded path and on our way uphill again for absolutely spectacular views over the bay. We could see most of the way back to Bossington Hill to the east possibly for the last time as we were about to turn the corner. Looking out to see we thought we could spot where Lundy should be but the day was far too hazy to see it. We met the road again at Watermouth Castle, a very pretty, revivalist gothic sort of building which is now a holiday camp. We also lost the path for a while in a campsite which made us realise what we were missing (not)… After our brush with the Bank Holiday tourist industry we were on our way to one of the high spots of the path, figuratively and literally. We struggled uphill on a fenced path through grassy fields before finding ourselves on Widmouth Head and we were so impressed with the view backwards, showing the natural harbour and rocky outcrops of Watermouth Bay, and the yachts going in and out under sail, that we had to stop and have some chocolate. A little further on, heading towards Hele Bay and lunch, we met a phenomenon instantly recognisable to anyone with a big rucksack. We fell into conversation with the family man, equipped with a wife and a couple of kids, who would far rather be doing your holiday than his own, and who eagerly enquires about all the details including how far you walk each day, how you cope with the packs, how it is all organised etc. The approach to Hele Bay is a gentle downhill one on a road and the place is charming in a thoroughly English holiday sort of way and also for not being Ilfracombe. On this Bank Holiday the tiny strip of gritty, grey, rocky beach was packed with families from nearby caravans and chalets. We always smile to see how these little settlements with so few natural advantages as a resort, manage to transform themselves into the seaside when they only have a few feet of beach and a lot of rocks to work with. Combe Martin and Lee Bay are both similar but they have considerably more resources. I wonder if the village elders lie in bed at night and dream of Perranporth or Blue Anchor? Hele Bay has a tiny promenade with railings, benches and seats in concrete shelters perfect for the hot hiker who needs to carry out an excavation to find a lunch box. We sat in the shade in one corner and were left completely undisturbed although the place was teeming. We spent a lovely hour sitting there and had to go and have a paddle. The path continues along the side of the beach where it climbs almost vertically back up into woods and after not very long at all Ilfracombe is upon you. We struggled up the paths, curiously reminiscent of the ones leading out to the Valley of the Rocks, until we reached the Iron Age hill fort called Hillsborough at the top. But, as happens all the time on such walks, you never have leisure or inclination to look at something you would probably drive miles to see in other circumstances. Ilfracombe is bloody hilly, there’s no other way to put it, and soon we were descending again, into ornamental gardens where we lay down in the shade of a tree and had a bit of a rest. We staggered on into the resort which was was teeming, simply full of holiday makers, and you cannot cope with that after a day of comparative solitude. And people kept staring at us. 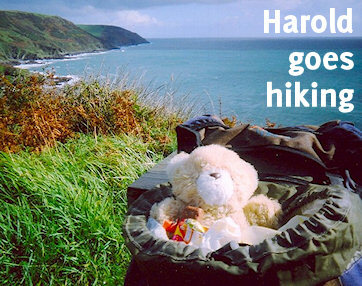 What is so fascinating to your average seaside visitor about the sight of a hiker? The path is allegedly signposted through the town which we had visited only once before. That time we sat on a wall and got dive-bombed by seagulls while eating chips and ice creams. This time we struggled to find where we should be heading and ended up climbing through another ornamental garden, full of twisty paths, ingenious ornamental bridges, wrought-iron benches, sweet little fountains and people wearing knotted handkerchiefs. And everywhere you looked were posters showing Peter Duncan appearing in a production of Barnum in the town’s theatre. We had been seeing these since Barnstaple. We knew we were sweaty, and irritable and were fully aware, thank you, that we were crimson in the face. But we were nearly out of Ilfracombe and on our way towards the formidable Torrs Walk, which we had been rather lugubriously warned about in Combe Martin. Just in case you have missed the point, or you can’t read contour lines, the map helpfully has the words “seven hills” printed on it. They introduce themselves with a towering ascent which made our hearts sink into our boots. Sometimes on the South West Way you wonder whether Poole is not actually several miles further above sea level than Minehead. We had also got ourselves stuck behind an alarming party of ramblers wearing pastel colours and suspiciously shiny boots. After a while it became obvious that these were not your usual kind of walkers but religious people on their way to a Catholic retreat in the foothills of this particular mountain. As we excused our way along the line their leader, an Italian monk in a sky-blue habit and carrying a rosary, hove into view. He was real, and not the result of heat and exertion because, when we said excuse me, can we pass, he turned around with a beatific smile and was perplexed to see two sweaty hikers he did not recognise intent on running up a six-hundred-foot ascent. We were looking down on the top of his head for some minutes although his flock soon disappeared behind us. He, doggedly, seemed glued to our heels. Were we saved – or doomed? The temperature dropped as we climbed a steep zigzag path, one of those where the top always seems just out of view and never is. As we gained height our equilibrium returned. We left the crowds – and monks – behind and the path became deserted. But at the top we met a man with a camera who was working on a glossy local tourist pamphlet and had been waiting up there for hours for some backpackers. He asked if he could take our photograph and Andy agreed but Lisa said no-one was taking a picture of her looking as she knew she did. The man needed a couple so we went on and left him, crestfallen, scanning the horizon. We met another chap with a dog who was travelling at a jog and anxiously enquiring about the direction of Ilfracombe and then began a slow and dusty descent along lanes into Lee Bay where we were due to spend the night. We passed the intriguingly-named Blue Mushroom, a landmark on the map, and were disappointed to find a beige bungalow covered in signs saying “Private!” We made ourselves walk an extra mile because we missed a short-cut footpath and walked around a loop into the village and then back out again. But the coast at Lee Bay, you can’t call it beach, is an amazing sight, a wide sweep of mud and pebbles full of huge rocks. There is a large hotel on the sea front and the area was full of bored teenagers in trainers and people in their early 20s who wished they had saved up for Marbella. To see so many holiday makers pretending they were in Brighton or Yarmouth was the really intriguing thing. We paused for ice creams and had to telephone in the end to work out where we should be but fortunately we were very close. We walked up to the house and found the owner sitting outside. After getting to our room all we wanted to do was to lose our horribly sweaty clothes and have a bath which was great. We then repaired to the village pub for dinner and arrived around 7pm to hear them calling last orders on food! They said we would have to wait an hour for it to be cooked and did we mind? Given few options short of walking back to Ilfracombe we agreed and spent a lovely evening sitting in the garden, drinking beer out of bottles and talking. After dinner we went back to the B&B where we spent an hour or so dodging a particularly ugly black spider. It finally turned up in Lisa’s boot the next morning with predictable results.